Be advised this trail was decommissioned in 2001. The bush gods have apparently reclaimed the forest. Travel may be difficult and painful. Of the many "Rock Creek" Trails that undoubtedly exist, this one is a shady, pleasant stream side trail in the eastern Superstitions. From the Miles Trailhead it follows Rock Creek upstream from its confluence with West Fork Pinto Creek about five miles to its end at Forest Road 650. From the parking area proceed west about .6mi on the West Pinto Trail (#212) past the scenic meadow and out buildings of the old Kennedy Ranch to the intersection of the Bull Basin Trail (#270). Here you go left, taking the Bull Basin Trail southwest as it begins to follow the Rock Creek to the Rock Creek Trail intersection at about 1.3mi. There is a pleasant open area here that looks to be popular for camping and you may notice an ancient rock grave(783) next to the trunk of a large tree. Jack Carlson, author of the excellent book "Hiker's Guide to the Superstition Wilderness", informs me that some cowboys found an anonymous body laying at that very site and just buried it where they found it. The Forest Service has officially decommissioned the Rock Creek Trail (formerly #195), so the old sign has been removed. I attempted to resurrect an old large cairn that appeared to be toppled over to help re-mark the intersection. In any event, the Bull Basin Trail climbs sharply left out of the creek bed, so if you merely stay in it you'll be fine. The trail itself is still in very good condition and quite easy to follow. Continue along the creek bed as the trail meanders from side to side through occasional narrow slots and shady stands of sycamore trees(765) beneath the impressive and aptly named Sawtooth Ridge(766). There are several springs(773) shown on the topo map plus a few more seeps and pools along the way, but nothing too appealing as far as filterable water during a dry September. At about 2.5mi you will come across an impressive little waterfall(776) not so much due to its height (@15'), but its very broad and straight and must be something to see when the water is flowing. At about the 3mi point there is a bit of a "trick in the trail", so to say. Considering myself as a somewhat wizened veteran of Superstition trails, I'm embarrassed to say I got taken in "hook, line, and sinker". Here's the devilish scenario: You're happily following the creek bed along it's left bank and due to the thick tree cover you can't see the opposite bank. Unbeknownst to you (especially since you're not paying attention to minor details like a map) you run into a tributary flowing in from the left and just to make it more devious, there is actually a nice trail (probably created by other poor hikers suckered in like me) continuing right along the same left bank as it so gradually and innocuously veers left and heads up the tributary away from the main creek bed.. The worst thing was how far I went up this thing before I finally admitted to myself that I screwed up! I'm at least a full mile up this thing when it starts to become a nasty bushwhack, but lo and behold there is a striking area of cascading bare rock pools which then I convince myself the trail was "obviously" named for, so I keep going! It was only when I topped out at a dead end in the middle of nowhere(772) that the truth became undeniable. I seem to have a definite propensity to make even the most potentially pleasant hike some kind of a "sweat and blood gruelathon". Anyhow, once back at the offending fork, it is easy to relocate the correct trail and I'm on my merry way again. From here it is more of the same with an easy to follow trail through nice riparian scenery(768) all the way to the 4.25mi point where the trail makes an abrupt departure out of the canyon and begins a steep climb up the bush covered slope to it's end at FR650 for about 5 miles total. Aside from some kind of a nonsensical shuttle setup, your return is merely back down the way you came. Although not a spectacular trail as far as the Supes go, this is a very pleasant hike and one to include if you enjoy the neat Miles Ranch area. 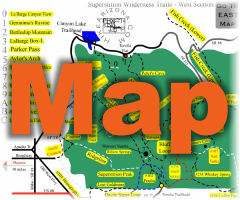 Directions to trail: From Superior head out east on US 60. Pass through the Queen Creek Tunnel and continue 10 miles to mile marker 239.4 Turn left onto this paved road that enters the Pinto Mine. Follow the paved road 2.8 miles and turn left onto FS 287. Go slow at the numerous intersections. Your goal is to figure out which are mine roads and which are public access. Public access signs are posted on most of the intersections. Some aren't exactly clear which way they are pointing. You will leave the private land of the Pinto Mine and crossover onto forest land. At about seven miles you turn left onto 287A. Follow FS 287A to the top where Haunted #203comes out then down into the valley to Miles (not a well defined trailhead since its a big area with lots of places to park). As of May 2002, Road conditions are great - medium clearance. Its easier than last year to get through the mining area. There is now a 'private' or 'Public Access' sign marking which way to choose at every intersection you come to, so just follow.